Marshalltown 503D Brick Tuck Jointer Features Size 6 1/2in x 1/4in - 165mm x 6mm.. ..
Marshalltown M506D Brick Tuck Jointer Features Size 12mm - 1/2in. 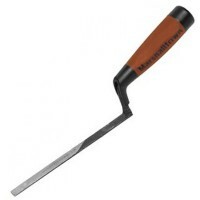 Pronounced taper ..
Marshalltown M505D Brick Tuck Jointer Features Size 10mm - 3/8in. Pronounced ..
Marshalltown Brick Jointer Features 5/8in and 3/4in - 16mm and 19mm brick jointer. ..
Marshalltown Brick Jointer Features 1/2in and 5/8in - 12.5mm and 16mm brick jointer. ..
Marshalltown M507D Brick Tuck Jointer Features Size 16mm - 5/8in. 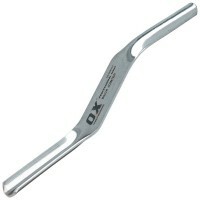 Pronounced taper ..
OX Pro Brick Jointer Features Size: 3/4in x 7/8in / 19mm x 22mm. 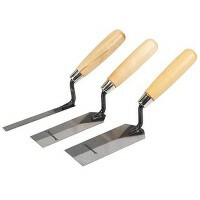 Manufactured from ..
Marshalltown Brick Jointer Features 3/4in and 7/8in - 19mm and 22mm professional brick jo..
Marshalltown M504D Brick Tuck Jointer Features Size 8mm - 5/16in. Pronounced taper ..
Marshalltown M508D Brick Tuck Jointer Features Size 19mm - 3/4in. 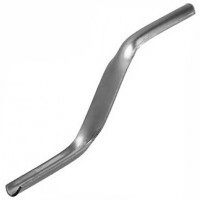 Pronounced taper ..
Marshalltown Brick Jointer Features 3/8in and 1/2in - 9mm and 12.5mm professional brick j..
OX Pro Brick Jointer Features Size: 5/8in x 3/4in / 16mm x 19mm. Manufactured from ..
Marshalltown M509D Brick Tuck Jointer Features Size 22mm - 7/8in. Pronounced taper ..
Marshalltown M510D Brick Tuck Jointer Features Size 25mm - 1in. Pronounced taper fo..
Silverline 868500 Margin Trowel Set Wooden Handle Features Hardened tempered steel blades..